The following very short essay, written by H. K. White, offers his remarks on the best poetic translations of two verses of the 18th Psalm and certain lines they inspired. ← Is God a Boy Rock or a girl pebble in the Bible? H. K. White is far too hard on Thomas Sternhold’s “Holye Songes of Veritie.” In preparation for some posts on the Sidney Psalter, I have been studying Rivkah Kim’s excellent English Metrical Psalms, who covers Sternhold’s translations in depth. I am encouraged to travayle furdre in the sayed boke of psalmes, trustyng that as your grace taketh pleasure to heare them song somtimes of me, so ye wyll also dlyghte not onlye to see and reade them your selfe, but also to commaunde them to be song to you of others: that as ye have the psalme it selfe in youre mynde, so ye maye judge myne endevoure by your eare. The period contribution to generic expectations of psalms was thus to emphasize traditional perceptions of the inherent mode of procedure in the biblical Psalms. This has long been recognized as a kind of teaching in its most affective form, and was defined by thirteenth-century scholars as the lyric mode of praise and prayer (modus laudis et orationis). [Note omitted.] Sixteenth-century commentators on the Psalms, such as Calvin, cited Augustine [e.g., as quoted by Whythorne: “to bee framed bi meaziurz good, þe eazier to repeat so þat meaziurz being but meeterz, and meeterz rithms to bee it argiuz þat þe hol salter with miuzik doth agree.”] and their own experience in support of their view that “le chant a grand force & vigueur d’esmouvoir & enflamber le coeur des hommes, pour invoquer & louer Dieu d’un zèle plus vehement & ardent.” [Note omitted.] There could be no better nor more appropriate “chansons” than psalms which acted like “aiguillons pour nous inciter à prier & louer Dieu.” [Note omitted.] This perception of their modus laudis et orationis was given form and substance in English in the “holye songes of veritie.” After the impact of Sternhold and his followers the psalm was regarded primarily as a vernacular lyric. It can thus be seen the Sternhold was arguably the most important translator for the most common presentation of the psalm in Protestant and vernacular Catholic worship: the sung psalm. His literary techniques were nothing short of brilliant. And in his era, he expected his audience to already be familiar with traditional English translations of the psalms, and thus in a better position to appreciate his artistry. White, Henry Kirke (1785–1806), poet and essayist, was born on 21 March 1785 at a house in Exchange Alley, Nottingham, the third of the six children of John White (b. 1750/51), a butcher, and his wife, Mary, née Neville (b. 1755). John White’s occupation was an established one in his family, running back to the beginning of the century. Mary White, who became a teacher in 1798 or 1799 when she opened a girls’ school, was the daughter of a framework-knitter who had come from Staffordshire to Nottingham to be apprenticed in the trade in 1728, but the Neville family had been yeoman farmers in Staffordshire from the sixteenth century. At an early age Henry Kirke White was sent to a local school run by a Mrs Garrington, who quickly recognized and nurtured his reading ability and other capacities. From here he went to the Revd John Blanchard’s school, reputedly the best in Nottingham. Blanchard further reinforced the view that he was a child of exceptional talent. White’s schooling was interrupted by his father’s need for assistance in his business, which led to a family dispute finally resolved by his eventual removal to yet another local school. When he was fourteen he found employment in the local textiles trade, working at a stocking-loom for about a year, before he found a place to train in the law, at the offices of Coldham and Enfield, town clerks and attorneys. There he began to learn Latin and Greek, which he worked at in the evenings, and extended his studies to include Italian, Spanish, and Portuguese as well as science. He also joined a local literary society at which he practised his skills in oratory. White’s first literary success is marked by his winning of two prizes in the Monthly Preceptor, for a translation of Horace in 1800, and an imaginary tour from London to Edinburgh in 1801. Further prizes followed, and thus encouraged White became a regular correspondent for the Monthly Mirror, through which he became acquainted with Capel Lofft, and the magazine’s owner, Thomas Hill. Lofft and Hill were both known for their work in supporting the notion of a specifically English canon of poetry, and their influence can be seen in White’s early productions for the Mirror, under the title of ‘Remarks on the English poets’. While there is no evidence to suggest that White was unhappy with his employment, a preference for a career in the church was evident by 1802. 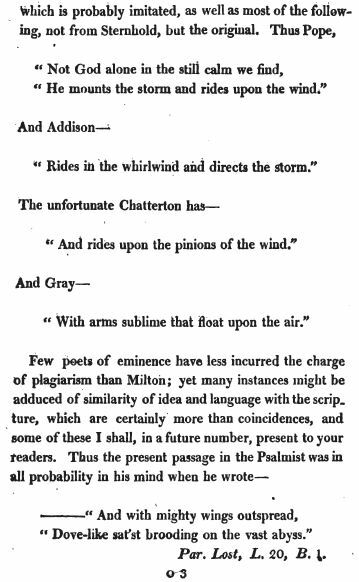 Such a move required study at one of the universities, and in order to raise some of the necessary funds, White began work on a small volume of poems that was published in 1803 under the title Clifton Grove, a Sketch in Verse, with other Poems. The volume was dedicated to the duchess of Devonshire, and unluckily described in the dedication as the ‘trifling effusions of a very youthful muse’, this deference being further reinforced in the preface where White compounded his vulnerability by stating his motive to fund his studies. Such gestures were relatively common at the time, and they invited an equally common response from the critics in the form of ridicule or censure. 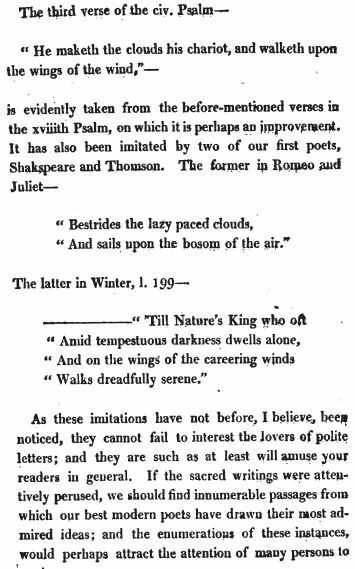 White was no exception: in the Monthly Review of February 1804, his volume was commended for its effort but damned for its evident failure in ‘the difficult art of writing good poetry’. More cutting for White perhaps was the reviewer’s exposure of his impecunity and scholarly ambition which also provided the platform for the assertion that should White ever gain the benefits of study ‘he will, doubtless, produce better sense and better rhymes’. This volume nevertheless attracted more favourable notice too, most notably from Robert Southey, whose interest in White resulted in some correspondence. Having failed to make money out of his poetry, White did not give up his plans to enter university. In fact his determination was strengthened by a deepening of his religious conviction, which had been disturbed for a while around 1801 by an interest in deism. By June 1803, however, White had committed himself to the evangelical movement in the Anglican church, and encouraged by his employers and his acquaintance with local clergy, he received an introduction to Charles Simeon, the famous evangelical at King’s College, Cambridge. Simeon secured for White a sizarship at St John’s, for which he was advised to prepare by studying for a year with the Revd Lorenzo Grainger, curate at Winteringham in Lincolnshire. In 1805 White progressed to Cambridge and competed for a vacant scholarship in his first term. In order to prepare for the examination White read widely and voraciously, neglecting his health in the process, but he was successful, and in his short time at Cambridge, he became a highly regarded scholar. However, White had been ill for some time with consumption, and the punishing regime he set himself for study exacerbated his illness. He died, unmarried, on 19 October 1806 in his rooms at college, and he was buried in All Saints’ churchyard, Cambridge. After his death a large quantity of verse and prose was found among White’s papers, and this material was given by his family to Robert Southey, who duly compiled The Remains of Henry Kirke White … with an Account of his Life (2 vols., 1807). By 1818 The Remains was in its tenth edition, including two American editions, and White’s reputation as a promising poet who had died tragically young was firmly established. This volume formed the basis of White’s reputation in the nineteenth century, and contains a range of poetry, including sonnets, odes, ballads, and descriptive verse, some religious, and some secular. Byron (a contemporary of White at Cambridge, although they never met) included a portrait of him in English Bards and Scotch Reviewers (1809) as a young genius of great potential, killed in part by his own excessive talent. Later, Keats’s friend Richard Woodhouse believed that Kirke White was one of the ‘lone spirits who could proudly sing/Their youth away, and die’ alluded to in Keats’s Sleep and Poetry (1817). Although there is little evidence to show that White had any influence of note on the poets of the time, there is no doubt about the fact that the success of Southey’s edition ensured that his poetry was widely read. The few attempts that have been made in the twentieth century to revive White’s reputation have been unsuccessful. White is rarely represented in anthologies or in accounts of Romanticism, despite the considerable merit of his work, and the potential for its recognition as a prime example of provincial writing in the period. Part of the reason for this rests with the still prevalent view that the significance of late eighteenth- and early nineteenth-century writing must inhere in its innovative qualities, and thus those writers who are working largely within the polite conventions of the period are not granted the attention so freely given to the Romantics. White’s works are characterized by a contemplative mode: his sonnets, odes, and longer descriptive and meditative poems commonly feature the solitary condition and pensive mind, and in this respect they belong to the tradition that runs from Milton through Gray to Wordsworth and Coleridge. What little attention White receives tends to highlight his early promise in the accomplished Clifton Grove, but his lyrics, sonnets, and odes also repay interest. Most neglected of all is the limited collection of prose pieces, and the series known as Melancholy Hours. Well, that’s quite a sad entry. I’m glad at least that you made an evaluation of one of White’s evaluations of one of the translations. It is also worth noting that Harriet Wilson’s Our Nig (which is often claimed to be the first known English novel written by a black woman and the first known novel to be published by an African-American) frequently quotes H. K. White, reflecting her sentimental genre. For tracking this, Skip Gates’s edition is particular useful. Yes, Wilson’s Our Nig quotes White nearly as much as it quotes the Psalms, from the KJV and apparently also from Isaac Watts’s versified translation. 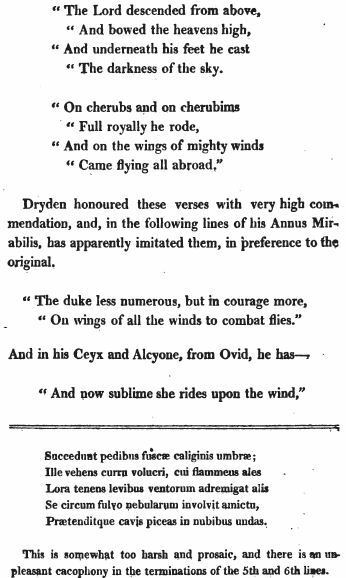 Sir Philip Sidney’s Astrophel and Stella consists of a number of sonnets, which have been unaccountably passed over by Dr. Drake, and all our other critics who have written on this subject. Many of them are eminently beautiful. The works of this neglected poet may occupy a future number of my lucubrations. Excepting these two poets [Drummond and Sidney], I believe there is scarcely a writer who has arrived at any degree of excellence in the sonnet, until of late years, when our vernacular bards have raised it to a degree of eminence and dignity among the various kinds of poetical composition, which seems almost incompatible with its very circumscribed limits. Experiments in versification have not often been successful. Sir Philip Sidney, with all his genius, great as it undoubtedly was, could not impart grace to his hexameters, or fluency to his sapphics. What is fascinating, to me, is how a poet may be a critic and a critic then a poet. Who better to be critical than a creator of verse? And yet it always seems that the human writer has to dip into two different genres. What I mean by that is there seems to be poetic language on the one hand. On the other, the writer as critic seems bound to prose, to a kind of meta-language, as if poetry is inadequate, as full and as rich as it is, to say all that one has to say. White’s line, “When Sidney sung his melting song,” in his poem “To The Earl Of Carlisle, K. G.”, may say more about Sidney and his poetry (in the eyes and ears of White for the ostensible perspective of the Earl of Carlisle and other readers) than everything else White tried to write about Sidney in prose. But I also want to emphasize the fact that White, in his “Remarks,” reproduced in my post, ignores, or at best neglects, the Sidney Psalter. I don’t want this to delay your posting on the Sidney Psalter, but have you read, Bibliotheca Pastorum V2, Rock Honeycomb: Broken Pieces Of Philip Sidney’s Psalter, Laid Up In Store For English Homes (1877) by John Ruskin? Ruskin publicly was “unconverted” from evangelical Christianity so says the Wikipediast or at least from biblically-hyper-literally-minded Christianity; and his reading of the Hebrew Psalms, against the Septuagint Psalms and the Vulgate Psalms and then against Sidney’s English versified Psalms, does make a quick allusion to the inadequacies of the Christian reading. The joyful and eager youth of a man like Sidney is necessarily incapable of entering into the darker thoughts of a heart like David’s in old age; and the general mass of amiably and pleasantly religious persons can no more understand a psalm, than a kitten a Greek tragedy; but we may always claim from them sincerity in accepting what is suited to their age; nor need we refuse to the young what farther pleasure or sense of duty they may receive from the chanting of noble words, because the days are yet distant by whose melancholy tutorship such words are to be made finally intelligible. Thus much it is enough to observe respecting the method of Sir Philip’s version. We must now finally note some matters bearing on its theological accuracy. As consummate expression whether of faith or feeling, the Psalter has retained its power among all nations worshipping the God of Israel, from the day it was completed to our own. But as a code of Christian morality, it has virtually ceased to be profitable to any of us ; — nay, has in many ways become confusing and dangerous, owing to the reckless choice, or transposition, of the terms, correspondent, in English, to those descriptive of virtue and vice, piety and atheism, in the original. I do not know how far, in the Hebrew itself, the subtlety and precision exist which ennoble the Septuagint and the Vulgate : but, assuredly, the writers of these versions understood from the Hebrew, and expressed in their own more capably various diction, a series of distinctions between the methods of vice and virtue in men, on the understanding of which is founded the proper philosophy of the Psalter, and which, neglecting, we read it absolutely without power of applying practically any one of its precepts, or apprehending intelligently the issue of any one of its promises or threatenings. With hugy darkness, which about his feet did wend. It seems there was some silence and even more criticism of the Sidney Psalter through the 17th century. What in this century of ours are we to make of it? Yes, I’m familiar with Ruskin’s Rock Honeycomb. Ruskin’s main analysis there is the display of different meters used by the Sidneys. I dismiss the aesthetic comments of Ruskin; he was too much of the Victorian establishment; and the late Ruskin pales compared to the brilliance of the early Ruskin. “Like in a winding-sheet.” I think Sidney interprets the fourth and fifth verses in too spiritual a sense. David could not have had, at this time of his life, any sense of the snares of hell in their reality. He seems to me only to be thinking of the day when he was first separated from Jonathan, Saul’s spear just missing him as he sang: so also, the passage describing the anger of God is meant literally, not spiritually, of the Philistines’ victory over Israel, and the captivity of the ark. The imagined cherubim were in captivity, that had lifted up their silent wings, — but God yet Himself “rode upon a cherub, and did fly”; the ark was lost from behind the veil of the tabernacle, — but His pavilion round about Him was dark waters, and thick clouds of the skies. Perhaps there is someone somewhere who finds that paragraph edifying; to me, it is simply silly, and illustrates well Ruskin’s complete confusion and lack of good literary judgment. Further Ruskin did not know Hebrew (there is some suggestion that Philip Sidney may have known at least a little Hebrew); and Ruskin does not engage with Defense of Poesy, which is central in understanding Sidney’s work. Rock Honeycomb is also flawed by numerous typos. Ruskin mentioned that the proofs of Rock Honeycomb created great trouble to both him and the printer’s reader, and that some errata escaped them both. But over all, Rock Honeycomb is a hack work, cranked out too quickly, and lacking real merit. I note that Ruskin, although he wrote out a manuscript for the sequel volume of Rock Honeycomb, did not publish it. It seems that even Ruskin regarded Rock Honeycomb as a failure. Ruskin did not know Hebrew (there is some suggestion that Philip Sidney may have known at least a little Hebrew); and Ruskin does not engage with Defense of Poesy, which is central in understanding Sidney’s work. And may not I presume a little further to show the reasonableness of this word vates, and say that the holy David’s Psalms are a divine poem? If I do, I shall not do it without the testimony of great learned men, both ancient and modern. But even the name of Psalms will speak for me, which, being interpreted, is nothing but Songs; then, that it is fully written in metre, as all learned Hebricians agree, although the rules be not yet fully found; lastly and principally, his handling his prophecy, which is merely poetical. For what else is the awaking his musical instruments, the often and free changing of persons, his notable prosopopoeias, when he maketh you, as it were, see God coming in His majesty, his telling of the beasts’ joyfulness and hills’ leaping, but a heavenly poesy, wherein almost he showeth himself a passionate lover of that unspeakable and everlasting beauty to be seen by the eyes of the mind, only cleared by faith? But truly now having named him, I fear I seem to profane that holy name, applying it to poetry, which is among us thrown down to so ridiculous an estimation. But they that with quiet judgments will look a little deeper into it, shall find the end and working of it such as, being rightly applied, deserveth not to be scourged out of the church of God. But now let us see how the Greeks named it and how they deemed of it. The Greeks called him ποιητήν, which name hath, as the most excellent, gone through other languages. It cometh of this word ποιεῖν, which is “to make”; wherein I know not whether by luck or wisdom we Englishmen have met with the Greeks in calling him a maker. Don’t you think it’s interesting that White also fails to engage with Defense of Poesy but even more so that he fails to engage with Sidney’s translation of the two verses of Psalm 18 that his essay discusses? Why?! Why this neglect or this intended silence? Also: You mention the “numerous typos” of this one work by Ruskin. What should we make of the spellings and type in this volume of the Sidney Psalms? 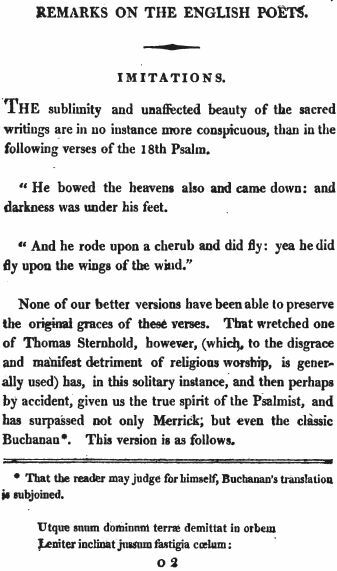 Do you think Ruskin was trying to clean up the English, as his spelling (focusing now just on the verses noted – Psalm 18:9-10) seems so different? Here’s the facsimile online version of the Sidney Psalms edited much later in 1963 by John C. A. Rathmell. With regard to spelling, I have not preserved the long S and have modernized the treatment of I and J and U and V. A number of emendations have also been made where an irregularity of spelling is likely to cause confusion (to for too, then for than, and the suffix -es for -ess); otherwise the Elizabethan spelling has been carefully preserved. With hugy darkness, which aboute his feete did wend. Cloudes, ev’n of waters dark, and thickest aire compos’d. When you compare, does the Ruskin or the Rathmell version of the Sidney change the spelling and punctuation in a better way? As we have seen in the instance of the Bay Psalm Book, the claims of fidelity have, in older glorious translations, interfered neither with the magnificence of style nor with accuracy. Translators and exegetes alike have invented meanings and words with the full powers of their determined imaginations. In our century, however, the Bible has suffered ignominiously “accurate” translations. Accurate has replaced literal as the word to justify bad translation. I cannot claim much expertise in the publication history of the Sidney psalter. The problem, of course, is that it was not printed in the 16th or 17th centuries — Mary seemed to want to control distribution and only distributed a very small number of hand copied versions. Another important text is Samuel Woodford’s copy of Mary’s autograph (in one history “which he rescued from his brother, who was using it to hold ground coffee.”) But this seems to be from an earlier draft and has variants that seem not to be authorial. It is not clear to me that Ruskin had access to any of these manuscripts, so his “corrections” are speculative. Rathmell’s edition was ground-breaking, but the manuscript problems were not fully addressed by him; a later edition (apparently made with Rathmell’s blessings) by Hannibal Hamlin, Michael G. Brennan, Margaret P. Hannay, and Noel J. Kinnamon in 2009, published by Oxford, is considered a much stronger version. Ruskin’s work is regrettable, not least because he badly slights Mary (the major author of the psalter) as one sees from the full title of his book: Rock Honeycomb: Broken Pieces of Sir Philip Sidney’s Psalter. But the reputation of the psalms has now been fully restored, and they are more popular than ever; indeed, some of them appear in the Norton Anthology of English Literature, the standard first year college textbook, so they are actually read. They are, now at last, part of the canon. Turning to White — he was just a kid when he wrote this, and his youth shows in his exaggerated prose — much like a blog post.